Mega Man X5 is the fifth entry in the Mega Man X series, released on the PlayStation on November 2000 in Japan, February 2001 in North America, and August 2001 in Europe. It was originally intended as the series finale, but this never came to pass. In the year 21XX, several months after the Repliforce war, Earth is enjoying a time of peace, repairing the damage caused by the war, including several major space colonies that were damaged, including the giant space colony of Eurasia. However, before repairs could be started on Eurasia, a mysterious figure commandeered the damaged colony, infecting it with the Sigma virus and setting it on a collision course with the planet, threatening to wipe out all life, human and reploid alike, off the face of the Earth. With only 16 hours until global devastation, X and Zero of the Maverick Hunters must quickly form a plan to save the planet from disaster. They quickly decide upon two plans, the main plan where they outfit an aging supercannon at the Maverick Base to destroy the Eurasia colony, and a backup plan, in which they need to repair a shuttle to collide with the colony before it hits the Earth. With time quickly running out, the two decide to split up and collect the parts for both plans, the world's fate in their hands. Crescent Grizzly (Grizzly Slash) gives Crescent Shot to X, and Crescent Sword to Zero; is weak to Spike Rosered's weapons. Volt Kraken (Squid Adler) gives Tri-Thunder to X, and Electric Blade to Zero; is weak to Tidal Whale's weapons. Shining Firefly (Izzy Glow) gives Firefly-Laser to X, and Chaos Flasher to Zero; is weak to Volt Kraken's weapons. Tidal Whale (Duff McWhalen) gives Goo Shaver to X, and Flying Splasher to Zero; is weak to Crescent Grizzly's weapons. Spiral Pegasus (The Skiver) gives Wing Spiral to X, and Wind Shredder to Zero; is weak to Dark Hold. Spike Rosered (Axle the Red) gives Spike Ball to X, and Twin Dream to Zero; is weak to Burn Dinorex's weapons. Dark Necrobat (Dark Dizzy) gives Dark Hold to both X and Zero; is weak to Shining Firefly's weapons. Burn Dinorex (Mattrex) gives Ground Fire to X, and Quake Blazer to Zero; is weak to Spiral Pegasus's weapons. Advancing Boss of Doom: In Tidal Whale's stage, there's a battleship that serves as an Advancing Mini-Boss Of Doom. Alas, Poor Villain: A few Mavericks went out of control due to the Sigma Virus infections, while others, such as Spiral Pegasus and Tidal Whale lost their will to live, and Burn Dinorex was consumed by paranoia. Their last request is to be Mercy Killed before they go insane. Only Spike Rosered and Dark Necrobat are truly assholes among the bosses. Amazing Technicolor Battlefield: The "Zero Space" stages qualify. Not a whole lot, but if you invested heavily in Zero, and the plans to stop the colony drop fails, X has 4 heart tanks (though he'll need Gaea and Falcon Armors to reach them) to help give him some extra health to help against enemies he isn't ready for. Despite the game being presented as a Timed Mission, you can take as much time as you want during stages, as time only ticks down when you enter a stage. As infamously difficult as the Ride Chaser segment of Volt Kraken's stage is (especially if you're gunning for the Falcon Armor Helmet,) the rest of the stage rewards the player with a ton of extra lives. Apocalypse How: Sigma intends on launching what could be a Class 3 to Class 4, as he intends to wipe out humanity, and possibly all biological life, off the face of the planet. Art Shift: X5 uses far more pre-rendered sprites than X4 and its mostly hand-drawn artstyle. X6 would follow up on this artstyle. Attack of the 50-Foot Whatever: Sigma in his giant battle body. Awesome, but Impractical: Zero's Z-Buster; it's extremely slow and deals less damage than Normal X's fully-charged shot. Back from the Dead: Presumed dead since the Classic Mega Man series, it's strongly implied that Dr. Wily has returned in some matter to inform Sigma about Zero's connection to the Maverick Virus, as well as somehow build Sigma a new battle body. How Dr. Wily returned and where he is after this game, however, are never explained or explored. Background Boss: Rangda Bangda W and Sigma's second forms. Bag of Spilling: Averted for once; X still has his X4 upgrades in the form of the Fourth Armor if you start a new game with him. Bat Out of Hell: Dark Necrobat, being a creation of Sigma himself; he is also the only boss who is officially a Maverick from the start, as opposed to being infected later on. Bears Are Bad News: Crescent Grizzly. Subverted when Monstrosity Equals Weakness comes into play, seeing as he's the easiest Boss in the game and he gives a pretty good weapon/technique to boot. Big Budget Beef-Up: Inverted; X4 had full motion video and voice acting, X5 doesn't. Big Damn Heroes: A variant: You as the player are the one coming to the rescue of the one in distress (who was even in disrepair), when Sigma personally attacks them. Bittersweet Ending: Regardless of whether or not the Eurasia is stopped, X and Zero nearly die in the fight with Sigma at the end of the game, and Zero is presumed dead. Especially bad if Zero did go Maverick, as after X is repaired, he no longer remembers Zero thanks to reprogramming that the Maverick Hunters can't undo. Oh, and even if you blew Eurasia to smithereens, pieces of it still end up hitting the planet. Lampshaded by Gate. Blob Monster: The infamous Yellow Devil from the classic series comes back in as the boss of the first Sigma Virus stage, now black-coloured and named Shadow Devil. Boss Banter: Like X4, the Mavericks will talk to the hunters before battle. The banter varies depending upon when the boss is talked to: Either pre-colony drop, post-colony drop, or colony explosion will all have different dialogues. The Skiver is one of the more blatant examples. Boss-Only Level: The Dynamo "levels" feature only him and absolutely nothing else. There isn't even a Boss Corridor! Call-Back: X and Zero's inevitable battle has been teased at ever since Mega Man X2. Came Back Strong: After getting inflicted with Doppler's antivirus in X3, and getting destroyed again in X4, Sigma is back yet again, and has not only completely overcome the effects of the antivirus, but is even more powerful than ever. He can bind himself directly to machinery and transform it to his will, and trying to destroy him again only allows the Sigma Virus to spread across the entire planet! Colony Drop: The giant space colony, Eurasia. Colour-Coded Timestop: The Dark Hold ability. Continuity Nod: A whole lot of them, as befits what was intended as the Grand Finale. The menu music (which is a remix of Zero's second theme in X1) has some nods to the intro of Mega Man 3. Tidal Whale's stage music is a remastered version of Bubble Crab's from Mega Man X2; however, Whale had an original theme before it was scrapped. Spiral Pegasus and Burn Dinorex are both former members of Repliforce; in fact, Pegasus will either mention the Colonel or Iris to Zero, depending on when he is fought. Iris will also appear in Zero's flashbacks during his ending. Spike Rosered brings up the Repliforce incident as well, when he accuses Zero and the Maverick Hunters of wrongfully (at least according to the law) classifying innocent Reploids as Mavericks. His fighting style also mimics that of Gemini Man from Mega Man 3. Volt Kraken is a retired member of the Maverick Hunters, and had a close connection with "Octopardo" (Launch Octopus). Dark Necrobat was built by Sigma to be a part of his Maverick army, before he defected and went into hiding. As a result, he is the only boss to have the classic Sigma insignia under his lifebar, as opposed to the skull the other bosses use. He's also similar to Shade Man. The Shadow Devil is an obvious reference to the Yellow Devil from the Mega Man (Classic) series; at one point, it even shapeshifts into the Wily Machine used in Mega Man 6. The stage you fight it in is also a homage to Quick Man's stage. In fact, it is 80 percent Quick Man's stage, excluding the boss. Shadow Devil's weakness is Tri-Thunder, which is basically a copy of Thunder Beam. This was definitely no coincidence. It also has a Dark Reprise of the very first Mega Man's Wily Boss Music. Throughout the fortress are green ride armor enemies with shields, filling the role of Sniper Joe. Rangda Bangda W is the second fortress boss. It is an upgraded version of the second fortress boss of Mega Man X1. Parts of the stage were also taken from the first Sigma Stage in Mega Man X, and its boss theme is also X1's fortress boss theme. If you go into the X vs. Zero battle as Zero, X will use several of the attacks he earned in X4 against you. If you use X instead, Zero's attacks are modified versions of his attacks in X2. The Sigma Virus taking the visual form of Sigma's head was first seen in Mega Man X2, and again in X3. Sigma's final battle body has several design elements similar to Gamma from Mega Man 3, especially the arms. This crosses into Fridge Brilliance territory when you take into consideration that it was Dr. Wily who made this body. After being absent throughout the entire Mega Man X series, Capcom brings one of the classic games' staple hazards: disappearing blocks. Fortunately, this is only for the final Sigma Stage for a small portion. Cultural Translation/Punny Name/Named After Somebody Famous: In the original English localizations of X5, the bosses' names were plays on current and former members of Guns N' Roses. Damage-Sponge Boss: The endgame rematches with the eight Mavericks turns them into this, giving them health bars that extend almost the entire length of the screen, so that it takes a while, even if you're using their weakness against them. In some cases, using their weaknesses stuns them for a much longer time than usual, making the battle last much longer. Darker and Edgier: It has an unusually oppressive atmosphere for a Mega Man game, thanks to the counter until the colony hits (though it doesn't matter much in practice), and there's a disturbing undercurrent that pervades the whole game, with the virus infecting everything, the trippy final stages, sinister hints of Dr. Wily's involvement with the faded W logos and old bosses from Classic Mega Man, Zero and X fighting each other and the former possibly becoming corrupted by the virus, and then finally dying no matter which ending you get. He gets better next game though. Even the regular Maverick boss theme is the darkest-sounding in the series. Death Is a Slap on the Wrist: Dying or continuing in the game just takes you back to the last checkpoint you reached in the level. Dig Attack: Crescent Grizzly starts abusing this when he Turns Red. He can either come out of the ground and does a drill attack or come out of the sides of the cave and slashes you with his claw. The Dragon: Dynamo to Sigma. Dramatic Thunder: The first boss battle with Sigma's head takes place in a thunderstorm. Dub Name Change: Infamously, all of the Mavericks' names were changed to homage members of the band Guns N' Roses (turns out Alyson Court, who was a member of the English localization team, as well as the voice of Claire Redfield, had something to do with this)note the exception being the Skiver, who is named after Michael "High in the Sky" Monroe, who frequently collaborated with Guns n' Roses. Averted with the manual of the game (in the western versions), which does use the original names rather than the changed names, and averted almost completely with the Legacy Collection restoring the original names in the game proper. Eldritch Location: The "Zero Space", a mysterious and inexplicable Cyberspace area that materialized somewhere in Earth's underground due to bits of Eurasia crashing into the planet coupled with the influence of the highly dangerous Zero Virus. It essentially looks like another dimension altogether. Everything's Better with Dinosaurs: Burn Dinorex, a fiery Tyrannosaurus rex Reploid. Dinosaurs Are Dragons: He can breathe fire and has fiery Stegosaurus-esque back spikes. Justified, though, since he's a robot. Dark Necrobat appears to be a more powerful version of Shade Man from Mega Man 7, in addition to stopping time, and summon a flocck of bats, he can dive into the player to drain the player's health. Face Death with Dignity: Zero's ending has him lay dying after the battle with Sigma, convincing himself that his death will finally bring peace. Fighting Your Friend: No matter what you do, X and Zero end up fighting each other. Fighting the Lancer: If you are playing as X.
Flunky Boss: Dark Necrobat can summon bat flunkies. Fire, Ice, Lightning: Burn Dinorex, Tidal Whale, and Volt Kraken, in that order. Foul Flower: Spike Rosered can manipulate rose vines and petals to attack you. Fragile Speedster: X with the Falcon Armor: It allows the best mobility of all armors, as it gives X the ability to fly for several seconds, and while flying, he creates an energy barrier in front of him, so the smaller enemies are unable to touch him. Its charged shot is a powerful laser that pierces through enemies, and actually connecting several hits to the bigger ones, and for its Giga Attack, X unleashes a flurry of vertical lasers that fill the entire screen, essentially wiping out small enemies, and dealing good damage to bigger ones; however, its downside is that, unlike with the Fourth Armor, X is unable to charge special weapons. Freeze-Frame Bonus: In the opening of the game, if you look very carefully at the bottom-left of the screen at the 0:33 mark, you can see the word WILY appear. During the X vs. Zero battle, the winning combatant remarks that they didn't expect the loser to use Soul Body as a final attack and then collapses from their injuries. If you squint, you'll see X/Zero actually send out Soul Body to attack the player right at the end of the usual explosion that signifies a defeated boss. Being infected by The Virus causes X to constantly take damage for a time. Zero becomes invulnerable. This is given further backing in the battle with Maverick Zero, who, if not defeated in a certain amount of time, becomes invincible and starts spamming Genmurei. At the start, the player has to choose which character to use for the first level: either X or Zero. Choosing one will have a bonus in that character's abilities (the Force/Fourth Armor or the Z-buster, respectively). The other bonus will not be available for the rest of the game, on account of being severely damaged by Sigma prior to the first Boss battle. Fail to stop the Colony Drop, and Zero will "awaken" and will be unavailable for the rest of the game. Dark Necrobat is a reploid created by Sigma for his Maverick army, but defected from Sigma and ran away. As a result, Necrobat is the only one of the eight bosses to have a Sigma insignia under his lifebar. When you go into the X vs. 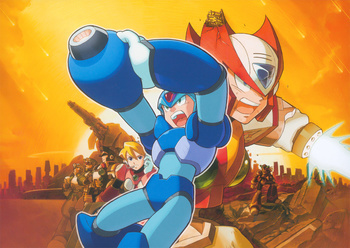 Zero battle, neither of the characters fought as a boss use any of the new moves in Mega Man X5. Against X, he will use several of the attacks he earned in X4 against you; his Soul Body is heavily altered and homes against you multiple times. Regular Zero uses the projectile moves he used in Mega Man X3, as well as an altered Messenkou (Ground Pound) move; his Z-Saber homes on you. This is averted on Maverick Zero because this is his first real appearance, if this path was taken. Grand Finale: Wraps up a lot of things in the X series, including confirmation that Dr. Wily created Zero and the Maverick Virus, includes the fight between X and Zero that was foreshadowed since the third game, and sets things up for the Mega Man Zero series. Unfortunately, Executive Meddling would ensure that the series would go on without Inafune's input, creating a Continuity Snarl between the X and Zero series. Guns vs. Swords: This happens in the fight between X and Zero, where X's X-Buster is pitted against Zero's Z-Saber. Whichever wins depends on who you play as. I Let You Win: It turns out that Sigma allowed the heroes to defeat him in the intro stage, which triggers the Colony Drop. Irony: X worries about Zero having been infected and may turn Maverick at any moment, so he confronts Zero and asks him to return to base for inspection. Zero, being both perfectly fine and fairly proud, doesn't want to go back. X, mistaking his friend's stubbornness as a sign of guilt and believing that the circumstances are too dire for him to afford taking the chance, attacks Zero. This parallels the events that led up to the Repliforce War in the previous game. Jack-of-All-Stats: Of the three armors X can carry (four if we count the Ultimate Armor), the Fourth Armor is the best balanced, as X is able to keep his abilities from Mega Man X4, such as hovering in the air, air dashing, the Plasma Shot, and the ability to charge special weapons. Just Before the End: Assuming that you fail to stop the Eurasia. The next game reveals that the attempt was enough to stop the extinction of all life on Earth, but failing to stop it completely still devastated the Earth. Kaizo Trap: Inverted in Volt Kraken's stage. If you don't know you're able to move as soon as you appear, you'll fall into a pit and die before the "READY" sign has even left the screen. Life Drain: Dark Necrobat can latch onto the player character and take away his health, akin to a vampire. X with the Ultimate Armor, which can be accessed via a cheat code: it's essentially the same as the Fourth Armor, with the addition of Nova Strike, which wipes out anything in sight, and allows X to take down bosses in a matter of seconds. Same goes to Black Zero, which is basically the same as Normal Zero, except that now the damage he takes is cut down by 50%, and his saber changes color, from green to purple, which lets him absorb enemy projectiles. Luck-Based Mission: The whole game (or at least the "destroying Eurasia" part) can count as this  you can try using the Enigma cannon from the very start and it still has a chance of success; conversely, even if you collect all the parts for the Shuttle, it may still fail. If you do, then the ending depends on who you're playing as for the final level, X or Zero. If you don't, then Zero will be unusable for the rest of the game. Mythology Gag: Many, considering the game was supposed to be the Grand Finale of the X series. The boss fight with Spiral Pegasus is very reminiscent of Storm Eagle from X1. The fight even takes place on a flying ship. Tidal Whale's stage pits the player against a massive submarine, much like Bubble Crab's stage did in X2. The stage music is even a cover of Bubble Crab's theme. Burn Dinorex's stage includes a segment where you can take a ride armor into lava just like Magma Dragoon's stage from X4. Both Spiral Pegasus and Burn Dinorex are former members of Repliforce, the villains from X4. Volt Kraken is heavily implied to have been friends with Launch Octopus from X1. Two of the Zero Virus stages include a fight with the Shadow Devil, a newer version of the Yellow Devil from the Mega Man (Classic) series, who also features an attack where it transforms into a miniature Wily fortress. The second fight is a rematch with Rangda Bangda from X1. Both fights are also accompanied by their corresponding boss themes. Sigma's first form will occasionally wall jump after the player if they climb up the wall, just like he did in X1 (though it's not as exploitable this time). His second form is also highly reminiscent of Gamma from Mega Man 3. One of the Zero Virus stages is made up primarily of One-Hit Kill lasers ala Quick Man's stage. This game also just so happens to have a time-stopping weapon in the form of Dark Hold. The final level begins with a section similar to Bubble Man's stage, complete with spike balls not seen anywhere else in the game. One to Million to One: Dark Necrobat is introduced this way: Multiple bat drones congregate altogether and then go away, revealing him. Orichalcum: In the Japanese version, this is the upgrade to the Enigma that Crescent Grizzly is carrying. In other releases, he's got a "Crystal Ball" instead. Permanently Missable Content: Albeit one that takes a bit of Epic Fail; if you get all the orbs in Squid Adler's stage, open the door and then somehow fall down the hole in front of it...you can't get back up to it. And the orbs don't respawn once the door has been opened. So if you do that and then save, a piece of the Falcon Armor is lost forever, plus all the other upgrades that require it. Posthumous Character: Despite being dead, Sigma is apparently able to communicate with Dr. Wily, learning about Zero's creation and purpose, and having Wily build him a giant battle body. Predecessor Villain: Hinted at for awhile, but Dr. Wily is officially given credit in this game for the virus and Zero's creation. Race Against the Clock: X and Zero have just 16 hours to stop Eurasia from crashing into the planet. Rank Inflation: Dynamo was actually a GA-ranked Maverick Hunter, one rank above Zero. That (and the fact that he sabotaged Eurasia by himself) doesn't help him much in the boss battle, however. Ramming Always Works: When the Enigma laser cannon fails, their next plan of destroying Eurasia was using a manned space shuttle with Zero piloting it as a last resort. Subverted in that it doesn't always work (sometimes even if you managed to get all the needed parts in time). Also a favorite attack for Spiral Pegasus and Burn Dinorex. Reality Ensues: Completely destroying Eurasia leads to bits and pieces of it falling to Earth, causing a fair bit of collateral damage. Red Right Hand: More like "Red Left Claw", but Crescent Grizzly is equipped with one that can turn into a drill. The Remnant: Spiral Pegasus and Burn Dinorex were affiliated with Repliforce from X4. Likewise, Dark Necrobat was one of Sigma's forces but then hid himself. Shout-Out Theme Naming: All the bosses were named after Guns N' Roses band members in the original western release. Dark Hold stops time in the same style as The World. You even get the weapon from a vampire bat Maverick. So Long, and Thanks for All the Gear: If Zero becomes Maverick, all the life/weapon up parts and Heart Containers that you had him get are gone for good. Something About a Rose: Spike Rosered, a Rose Reploid. Spell My Name with a "The": The Skiver. Suicide by Cop: The sad reason you're fighting many of the bosses. Having realized they've been infected by The Virus, they provoke X or Zero to fight them to the death, preferring that to going Maverick. Training Stage: The game has a dedicated "Training" stage not seen in any other game in the series. Through the Mission Control Alia, it teaches you the basics of the game's platforming for both X and Zero, and ends with a watered-down version of Magma Dragoon from the previous game as the training boss. Trippy Finale Syndrome: The final stages, in spades. Neon-lit platforms, flashing background, and the techno music will make you think it's some kind of drug trip. Tunnel King: Crescent Grizzly will dig into the ground and jump in to attack once his health is depleted enough. Unfinished, Untested, Used Anyway: Sigma admits his Final Boss battle body has not yet been completed, but it should be powerful enough as is to finish off X and Zero. Visual Pun: Spike Rosered/Axle the Red's stage opens with a background of a rose garden and handgun-shaped cannons sticking out upward. Now that explains the Dub Name Change. And it's Sigma, of all people, who is fought in the opening stage this time. Of course, Sigma then later comes back as the Final Boss as usual. And the boss of the tutorial stage is Magma Dragoon, who was That One Boss in the previous game. Thankfully, he was toned down a lot since then. Crescent Grizzly is the first boss offered in the stage line-up, and usually recommended to be fought first. He is also the easiest of the eight Mavericks to defeat, and gives Zero one of his most valuable attacks. Wave Motion Gun: The Maverick Hunter's aging supercannon, Enigma. X's F-Laser, when charged, can become this. Wham Episode: Is this to the entire Mega Man mythos. Because of the Colony Drop, Earth suffered a huge loss of life and was nearly ruined by it. The consequences of this would be felt all the way to the Mega Man Zero series, a hundred years later. What Happened to the Mouse? : Dynamo was built up as a formidable opponent since the start of the game, acting as Sigma's new Dragon, being the one responsible for infecting Eurasia and causing it to crash to the planet, and personally challenging the Maverick Hunters at their own HQ twice to slow them down. However, once the final levels start, Dynamo mysteriously disappears from the plot. He does end up making a return in Mega Man X6, but as this was originally intended to be the Series Finale, it's still a bit glaring how he's just suddenly dropped from the story.